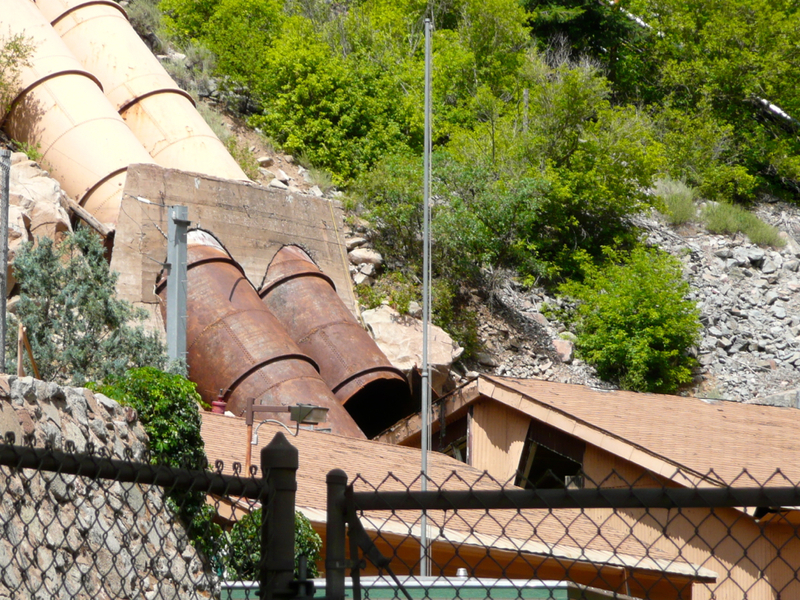 The penstocks feeding the Shoshone hydropower plant on the Colorado River in Glenwood Canyon. 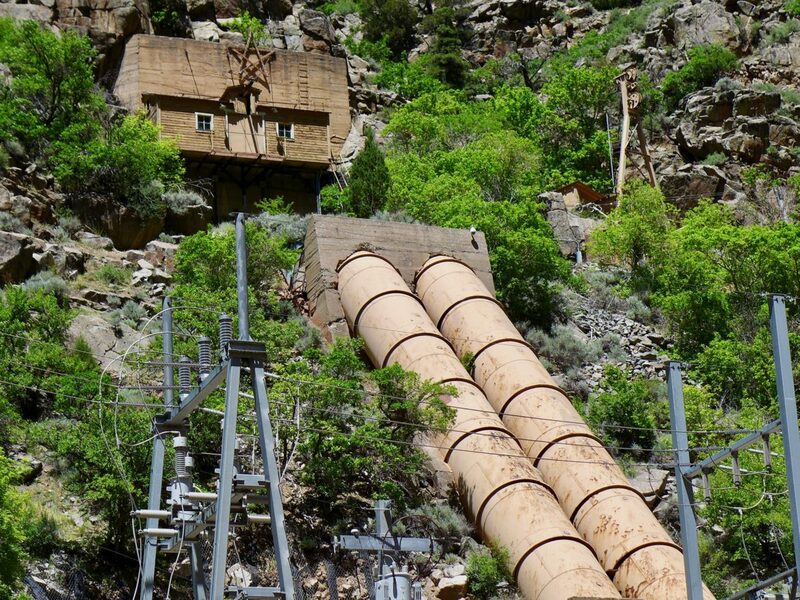 The Shoshone hydropower plant on the Colorado River east of Glenwood Springs was not producing power for most of last week, but regional water managers went with the flow and — thanks to an “outage protocol” — honored the plant’s senior water rights anyway. Plant operators with Xcel Energy notified state, federal and regional water managers April 5 that they needed to inspect a leak in a diversion tunnel adit, or access point. To do so, they would be slowly shutting the flow of water to the plant’s two 7.5 mega-watt (MW) turbines and taking the plant offline. 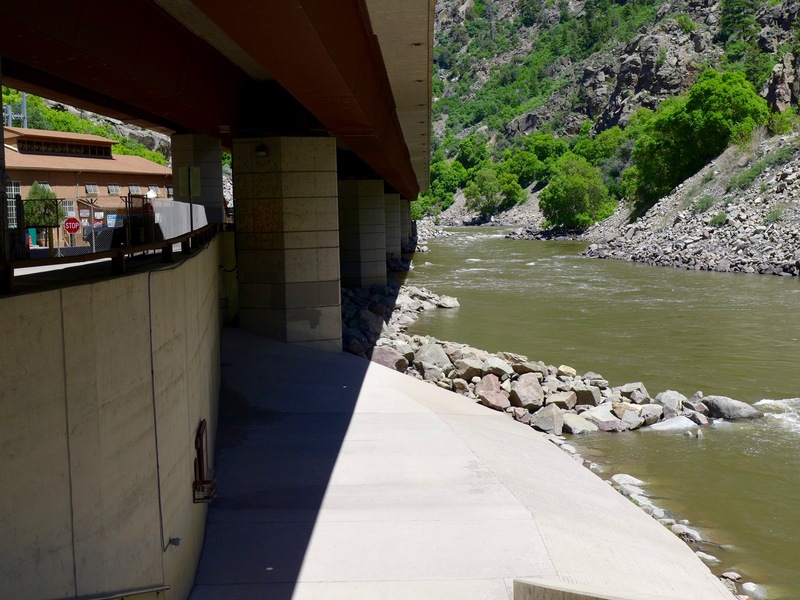 The facility’s two-mile-long tunnel runs through cliffs in Glenwood Canyon and moves water from behind a dam on the river to the penstocks above the plant, which is just upstream of the boat ramp for the Shoshone run. The plant, which Xcel began powering down April 5, was offline by April 8. The plant stayed offline until Friday, when the leak in the tunnel was fixed and the plant began powering back up, according to Michelle Aguayo, a media-relations representative at Xcel. The outage at what Xcel calls the Shoshone Generating Station did not affect local or regional power customers, because other electricity on the grid system made up for the loss of the plant’s capacity, Aguayo said. The Shoshone plant and boat ramp on the Colorado River. In response to the plant going offline, officials at the state division engineer’s office lifted the call on the river on April 8. If the hydro plant is not in operation, the water right tied to it is not being put to beneficial use and cannot be administered, or legally enforced. The call for water that is tied to the Shoshone plant’s most senior water right from 1902 means junior upstream diverters have to forego storing or diverting enough water to keep 1,250 cubic feet per second of water available for the plant. Without the call, and the outage protocol, more water could be diverted under the Continental Divide or kept in upstream reservoirs, and less would flow through Glenwood Springs. The blown-out penstock in 2007 at the Shoshone plant. The outage protocol concept was prompted by the increase in outages at the Shoshone plant starting in 2004. It took on greater importance when a penstock at the plant ruptured in 2007. The protocol was given a trial run in 2010, formalized in 2012 as part of the Colorado River Cooperative Agreement, and then signed as a stand-alone agreement in 2016. Parties to the protocol include the Colorado River Water Conservation District, the Bureau of Reclamation, Denver Water, Northern Water, Aurora and other entities. 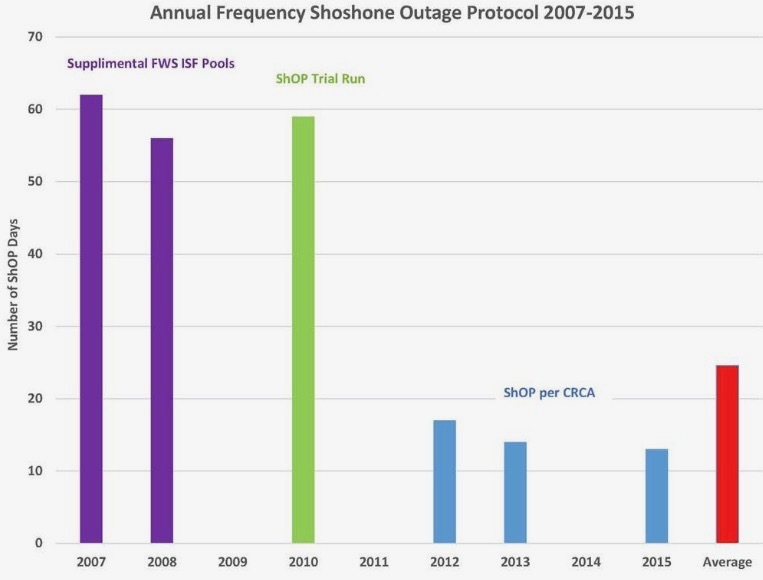 Number of days the Shoshone outage protocol, or ShOP, was in effect, and stages of the agreement. According to Don Meyer — who is a senior water-resources engineer at the Colorado River District, which is based in Glenwood Springs — the protocol was in effect from April 8 until the call came back on the river on Sunday. And he said it worked as intended, with the parties cooperating in an amiable manner. “Without the outage protocol, the river probably would have been impacted,” Meyer said. He also didn’t think most upstream operators changed how they were managing their water, because the protocol meant they were still working against a need to keep flows on the river at 1,250 cfs, even with the plant offline. The river rose, on its own, during the time the plant was out. But the outage protocol also helped boost flows. 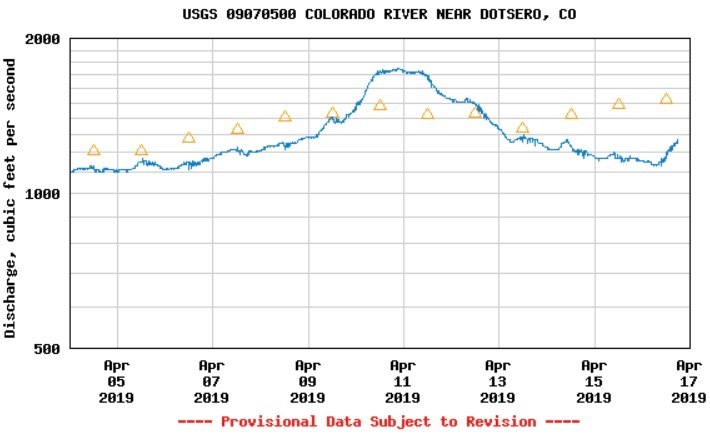 The river’s level was also helped by a short warm spell that caused flows at the Dotsero gage, where the flow to Shoshone is measured, to rise above 1,250 cfs starting the day that the plant first started powering down on April 8. By April 10, the river had risen to 1,750 cfs. But then cold weather dropped the river back under 1,250 cfs on Sunday, as forecast, just when the plant was powering back up and the call was coming back on. If the plant had been down longer, and flows had stayed low due to cool mountain weather, the outage protocol could have mattered more to the flows in the river. Meyer said that when the plant was offline for repairs in 2012, the outage protocol kept the river through Glenwood from falling below 1,000 cfs for about two weeks in late June of that notably dry year. 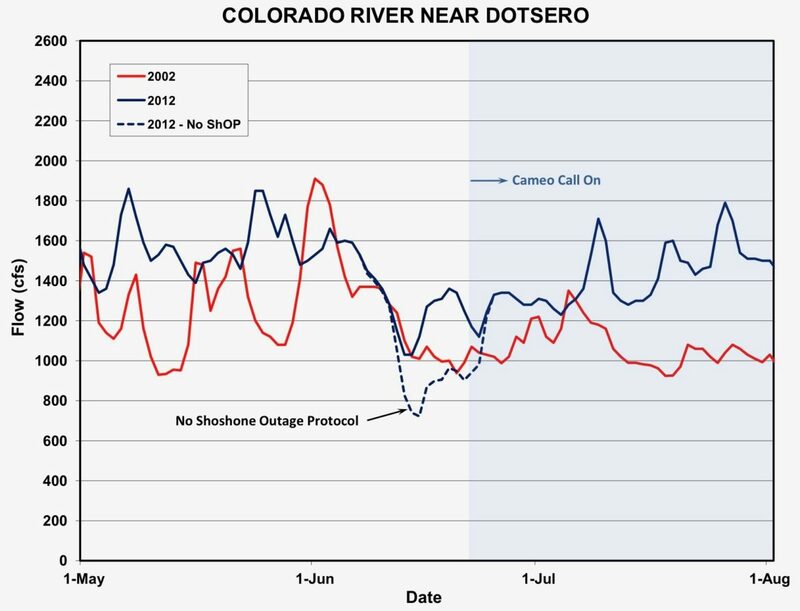 The Shoshone outage protocol’s effect on flows in the Colorado River in 2012. Editor’s note: Aspen Journalism covers rivers in collaboration with The Aspen Times, the Glenwood Springs Post Independent, the Vail Daily, the Summit Daily and the Steamboat Pilot. The Post Independent and The Times published this story on April 16, 2019.